California poppy is a vibrant state symbol on the North American west coast, but few now remain who remember the flower's great medicinal value. A beloved symbol of the Golden State, the California poppy has been well-known for centuries because of its vibrant color and impressive ground coverage. Less well-known, however, is its long-standing history as a medicinal herb and even, for native populations of the area, its value as a food source. Relieving the symptoms of anxiety. California poppy gently regulates the nervous system, affecting neuroreceptors and enzyme activity in the brain. Inducing sleep and tranquility. This plant has gentle sedative effects. Treating problems with bedwetting. The plant was historically considered gentle enough to treat psychological and behavioral ailments in children. In addition, Native American herbal tradition frequently employed California poppy as a painkiller and sedative, particularly using its leaves and flowers to relieve toothaches. Researchers believe the main active ingredients in California poppy are isoquinoline alkaloids, and that these are behind the plant's medicinal properties. Experimental evidence further suggests that some of the secondary medicinal benefits of California poppy may lie in other alkaloid compounds, such as californidine and escholtzine, which are named for the plant. Despite the name similarity, the mechanism of action of California poppy is completely different from that of its cousin species, the opium poppy. For this reason, it has a much smaller potential for toxicity or creating dependency. Sedative an anti anxiety properties are also present in lemon balm and valerian. Though the herb appears to be safe when taken for periods of three months or less, moderation should always be exercised. California poppy has not known culinary uses. However, remedies are made from the aerial parts of the plant. They are largely used for promoting relaxation and sleep. Infusion. California poppy teas and tisanes are considered safe when used in moderation for three months or less. Many choose to sweeten them with mint or even honey. Liquid extract. Liquid extracts are the most common commercial preparation of California poppy. Capsules. Supplements provide the most consistent dose of California poppy. In the U.S., it is relatively easy to find California poppy supplies for at least half the year. Full-sized California poppy plants can be seen - but not harvested - in abundance in the wild within original areas. They are also widely sold during spring and summer months at garden stores and nurseries. Seeds to start the plants from scratch can be found in similar locations. California poppy dried leaves and powder are easier to purchase through online retailers, although specialized health stores can have this and other remedial forms of the herb. Available in capsules and liquid extracts, California poppy has become more popular in recent years, though supplements are still not widely available. Wholesale retailers may carry them alongside other herbal products, but more frequently, they can be found through online outlets, which carry the biggest selection of types, concentrations, and brand names to fit personal consumer preferences. Existing as both an annual and perennial depending on the climate, California poppy grows successfully in diverse regions. Though California poppy is tolerant to both drought and desert-like conditions, it flourishes in temperate climates where temperatures hover around 55°F (13°C). The best soil for California poppy to grow is poor, with a good drainage. Seeds should be planted at a shallow depth during autumn or early winter months to allow for germination in the spring. Harvesting California poppy is safe around the first frost of the following year. Transplanting is not advised. Native to the west coast of North America, Californian poppies get their common name from the region that encompasses most of their native population, although they can be found as north as Canada (British Columbia province) and as far south as Mexico. California poppy grows to approximately two feet (60 cm) tall. It has fine, deeply dissected leaves and remarkably bright blooms, their four petals ranging in color from yellow or pink to orange and even red. These petals fall off after pollination occurs, and the subsequently-developing capsule releases several small seeds. California poppy is the most widespread of the 15 species of the Eschscholzia genus found in California, and it is also part of the Papaveraceae family, composed mostly by herbs (less commonly shrubs or trees) with about 200 species across 25 genera. Another notable member of the also called poppy family is earth smoke (Fumaria officinalis). With over 90 synonyms used to describe the flower, distinguishing firm subspecies of California poppy has been a matter of contention. Some experts say that there are two: E. californica californica, which grows throughout California and Oregon, and E. californica mexicana, or Mexican gold poppy, which is found in the Sonoran Desert. For ornamental purposes, hybrids have been created with other plants to make award-winning cultivars such as 'Dali', a red version; 'Lemon Bush', which is pale yellow; and the 'Thai Silk Series', which is a mix of different hues. Long before the first European settlements appeared in the Pacific, Native American tribes used California poppies as both a food source and herbal medicine. The flower grew so abundantly that by the time Spanish sailors first glimpsed the coastline, they nicknamed it "the land of fire." The genus Eschscholzia was named after Johann Friedrich Gustav von Eschscholtz, a Russian scientist and explorer who made a significant contribution to the classification of botanical and animal species along the Pacific Coast during the 19th century. In 1903, shortly after California became a formal part of the United States, Eschscholzia californica was proclaimed the official state flower. 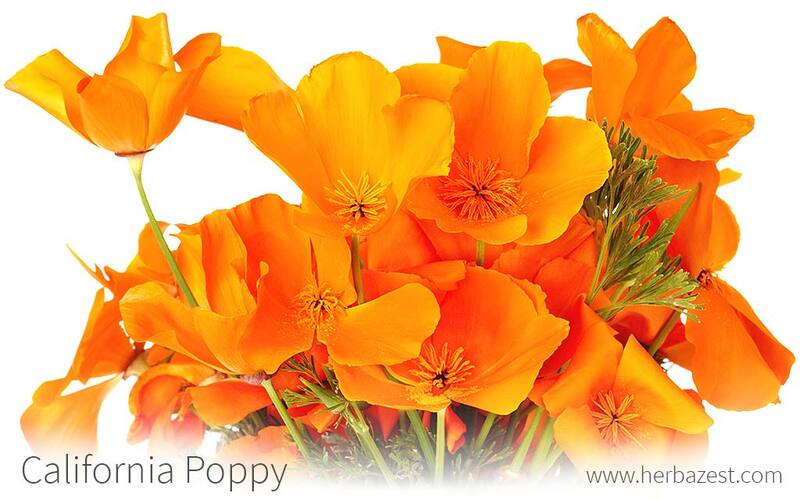 To this day, April 6th is known as California poppy day. Though still used as herbal medicine in some areas, California poppy is not cultivated for widespread commercial use except as an ornamental plant. Especially in native regions, where it is most prominent in the wild, it is considered an invasive species. Scientific research from the past few years, however, has revealed it to be an important part of the state's natural ecosystem, ideally making up 16% of the wild flora. In the U.S., herbal supplements that feature the flower are also increasing in popularity, opening a new potential market. The first Spanish settlers called it copa del ora (cup of gold), believing that the orange flowers of California poppies were particularly abundant in areas filled with the precious metal. Today, the most common use for California poppy is ornamental, a popular garden plant and even a cultural institution in the state of California. As the official state flower, the Antelope Valley California Poppy Reserve is dedicated to its wild growth, and it is illegal to damage the species within state lines. Other uses for the bloom have not been explored, but its propagation nonetheless thrives.